Binoculars are essential for hunting or bird watching, but why leave them home when you go on vacation? Whether you are going to the Grand Canyon or adventuring in New Zealand, taking a quality pair of binoculars with you can improve your sightseeing experience. Imagine a deep sea fishing trip. In the water toward the horizon you see shapes bobbing up and down. With binoculars, you’ll be able to clearly see that the shapes in the distance are really dolphins frolicking or blue whales coming up for air. Traveling to the Costa Rican rain forest? Monkeys, exotic frogs, brightly colored butterflies and birds such as the purple gallinule, are skittish around people and rarely let them get close. High-end birding binoculars will let you analyze the details of delicately patterned butterfly wings or the vibrant colors and feather textures of tropical birds without scaring your viewing objective away. Going on Safari in Africa? Lions, elephants and other wild animals are dangerous. 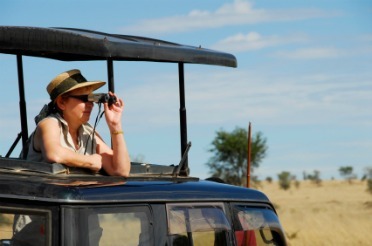 With binoculars you can catch once-in-a-lifetime glimpses of exotic animals from a safe distance. Vacationing someplace more populated? Binoculars are fantastic city accessories as well. Missing the architectural details of an ancient sports arena, like the Coliseum in Rome, would be as bad as missing the winning touchdown at the Super Bowl. A good pair of binoculars will ensure that you see both. Whether camping or trekking in exotic locations across the globe, packing a quality set of travel binoculars will guarantee an unforgettable sightseeing experience. Because the sun and weather can blur the images you view through your binoculars, planning ahead for such events will improve the quality of your holiday adventures. EyeShields from Field Optics Research attach to most binoculars and provide extended and enhanced viewing experiences by blocking glare, dust, wind, and other distractions. With a quality pair of binoculars and binocular accessories like EyeShields, you won’t miss any of the details that make a vacation memorable.